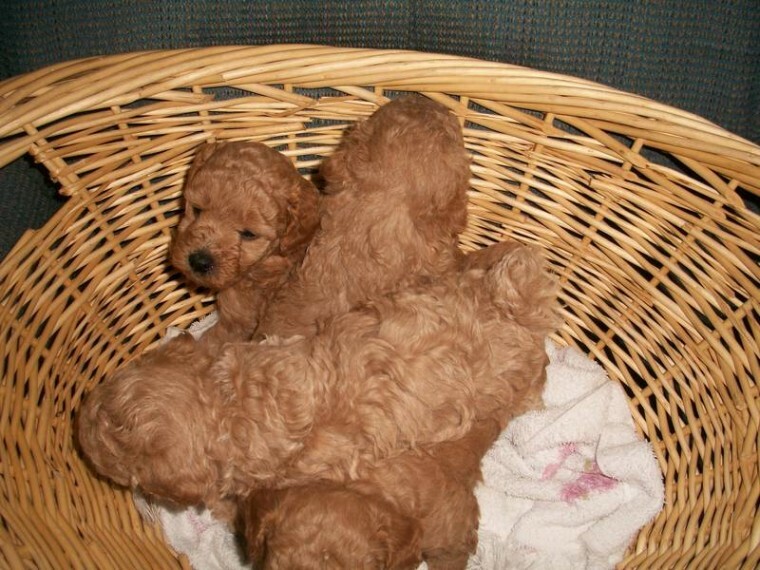 Gorgeous red toy poodle puppies, loving and sweet with the waggyest little tails imaginable, not ready till they are 8 weeks but can be viewed now by potential new families. Poodles are exceptionally loving, loyal and intelligent little dogs who make ideal companions for most families, but do love company so no full time workers, they also have wool rather than hair so are completely non moulting which is ideal for anyone with allergies in the family. Both mum and dad are stunning soppy family pets and head turners wherever they go, Our lovely babies are being raised in our noisy family home with children so will be very used to family life. Both mum and dad are kc reg and papers are ere to be seen, I will give a copy of both parents kc pedigrees with each puppy. They are being regularly wormed every 2 weeks and will be microchipped. Please give me a ring any time if you would like to come and meet them .